Cranberries are traced to early Native Americans in the 1500’s..They used the fruit as a food, as a dye, and even medicine long before the first English settlers arrived to co-opt the berry’s usage. National Geographic says that cranberries are the original “super food”, used by Natives as well as settlers. Cranberries were a staple among North American Natives, but the method of preparation varied. Of course, they were eaten as fresh fruit. Some tribes dried the fruit and formed them into cakes to store. Others made tea out of the leaves. Members of the Cree people would boil the fruit and used it to dye porcupine quills for clothing and jewelry. The Chippewa people even used cranberries as bait when trapping the snowshoe hare. Of all fruits available for purchase, only three – the blueberry, the Concord grape and the cranberry – find their roots in North American soil. Pilgrims learn to use cranberries from the Native Americans in 1620, and from there, about 60 years later, they made the first cranberry juice. In the early 1800’s, Captain Henry Hall, a veteran of the American Revolution, first cultivated cranberries in Dennis, Massachusetts. He began exporting them to Europe in the 1820’s. Industrialization took place for the cranberry industry in the US in 1947, when walk-behind mechanical dry harvesters replaced hand scooping. The machinery resulted in the first million barrel national cranberry crop in 1953. Today, cranberries are commercially grown throughout the northern part of the United States. You can find fresh cranberries at farmer’s markets and in grocery stores. They come dried, canned, bottled, and juiced. Farmers in America now harvest about 40,000 acres of cranberries each year, according to The Cape Cod Cranberry Growers Association. When cooking with cranberries, it is always best to go with fresh fruit, rather than dried or canned. 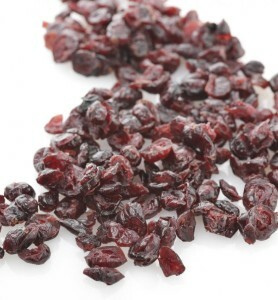 Dried cranberries may add sugar, and other unhealthy processed ingredients. Protip: Be wary of “sweetened dried cranberries” – a commercial product that’s literally more sugar than fruit. Many of the commercial brands sold in grocery stores have added sugar. Check the label to find out what you’re getting. 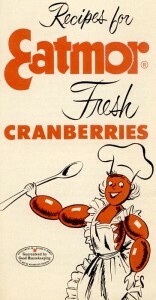 The recipes below are adapted from a booklet that was published in 1953, called Recipes for Eatmor Fresh Cranberries. Boil sugar and water together 5 minutes. Add cranberries and boil, without stirring, until all the skins pop open—about 5 minutes. Remove from heat and cool in saucepan. Makes one quart 10-Minute Cranberry Sauce. Combine cranberries, water and sugar in saucepan. Cook until cranberries are soft. Put through sieve or food mill. Soften gelatin in cold water and dissolve in hot cranberry puree. Stir in fruit juice and rind. Cool. Pour into refrigerator tray and freeze until firm. Makes 1 quart. Roll out half of pastry and fit into 9-inch pan. Slowly stir sugar and water into the cranberries in a large saucepan on medium heat. Cook until cranberries pop—about 10 minutes. Make a paste of cornstarch and remaining water in a small bowl. Slowly stir into fruit and continue cooking until thick and translucent (about 5 minutes). Cool and pour into pie shell. Roll out remaining pastry and cut in strips. Arrange crisscross fashion over top. Bake at 425° F. oven 25 minutes.